There's a growing push-back for digital advertising ... while all the traditional forms are fully supported. You can do all kinds of futuristic marketing in print without ruffling a single feather. But if you send an advertising email, you're going to the spamcops! Let's see where we are . . . .
Is Advertising Technology Making People's Lives Easier? ould the Burger Wars see peace in our times? Probably not, despite Burger King's best efforts at calling a temporary truce (while cooking up publicity). 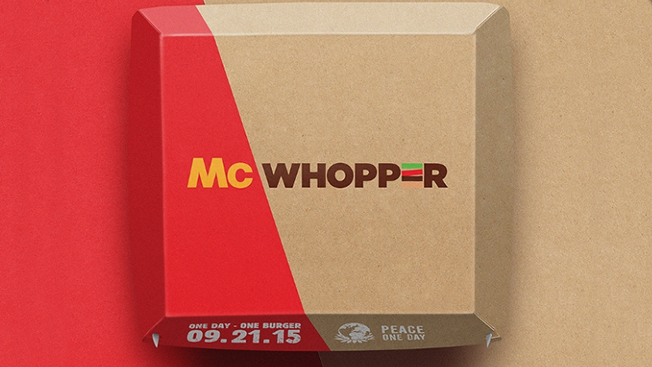 Burger King purchased a full-page ad in both The New York Times and the Chicago Tribune, asking McDonald's to partner with its longtime rival to create the McWhopper in honor of the upcoming Peace Day. As the saying goes : According to a new survey, we can make you believe anything as long as we say 'according to a new survey' . . . but in this case, the survey is real, and you should pay attention. According to a global Forbes Insights survey of executives world-wide, the technologies that enable brands to target exact audiences with the right messaging and to validate reach and effectiveness are relatively new. Brand marketers are seeing the value in audience targeting for their campaigns and recognizing the importance of reaching the right audience to add relevancy and truly make a difference. The study finds that these tools have clearly addressed a market demand and are providing marketing and advertising executives with much-needed insight. Digital advertising has been blacklisted. Everyone is so fixated on content marketing, and organic search that even uttering the words 'let's pay for some traffic' have become awkwardly pushed to the side. But don't be fooled. Even the most successful 'content marketers' are still using digital advertising tactics to get their content found. They might just not tell you about it – because it contradicts their methodology. We can't forget how effective ads can be for getting our products and services found – but we need to be aware of how the landscape is changing. And while it is undeniable that these advancements have made us faster and cheaper, the jury is still out on whether or not we are always better. The driver of our collective insecurity over our success is not that technology is flawed, but whether we are anchoring to the wrong problem. We are relying on technology to make our work easier to accomplish vs. making people's lives easier. Back in the good old days of traditional media, advertisers and publishers were the best of friends. Publishers of newspapers and magazines and other things enjoyed a monopoly on information distribution, and therefore commanded a large share of the attention of readers, and advertisers piggy-backed on that monopoly, which in turn helped to pay the freight for all of that content. Unfortunately, the Internet has changed all of that, and now the advertising business is as much a threat to traditional media entities as it is a friend. ... in the long run, there could be a hidden benefit to blocking ads for advertisers and publishers: Ad blockers could end up saving the ad industry from its worst excesses. If blocking becomes widespread, the ad industry will be pushed to produce ads that are simpler, less invasive and far more transparent about the way they're handling our data — or risk getting blocked forever if they fail.